By default the TalkTalk router blocks access to the TeamViewer website/app. Fortunately it is easy to stop it. TeamViewer is a fantastic program which allows you to remotely control your computer from other computers or your phone. It is a powerful tool which is free for personal use. TalkTalk provide a service call HomeSafe to all of their broadband packages. This serves to filter your home internet connection avoiding suspicious websites and inappropriate content. However one of the sites that the system blocks is the TeamViewer site (I have no idea why). It is very easy to fix though. Go to your TalkTalk “My Account” page then under “My Services” click on “View Homesafe settings”. This link should take you straight there (you’ll need to login). Now, you’ll need to enable “Kids Safe” mode (you can’t allow new services through without enabling it, yet it does block them?!). You can then click on “Choose which websites to block and allow”. 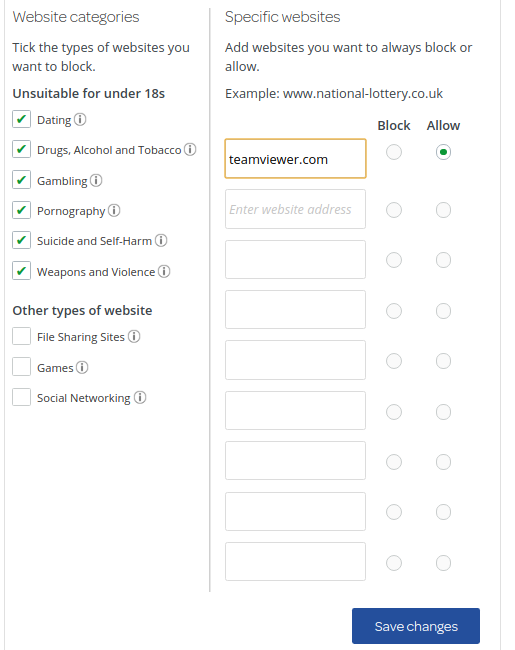 Then on the right hand side of the popup box (“Specific websites”) enter ‘teamviewer.com’ and then make sure “Allow” is selected and click “Save Changes”. Then you’re good to go and you should be able to visit both the TeamViewer homepage and actually use the program on your home broadband.